What a Trezor does is making it safe to use cryptocurrencies. This is the reason why in 2014 the guys from Satoshi Labs started selling the first ever Bitcoin hardware wallets. A Trezor locks your private keys inside the device. After initialization, it’s impossible to extract the private keys from the Trezor, so your bitcoins are stored securely. They designed a protocol that makes it possible to communicate with your Trezor device securely. 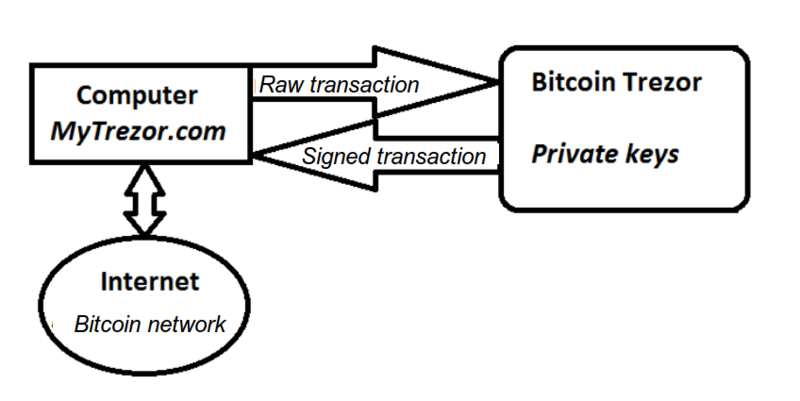 When you create a bitcoin transaction in your Trezor compatible Bitcoin client (for example Electrum or MyTrezor.com) you send an unsigned (“raw”) transaction to your Trezor device. The Trezor will show the transaction details on his screen and you need to manually approve your transaction by pressing a button on your Trezor. When you confirmed the transaction by pressing the button, your transaction is signed by the private key in locked away in your Trezor and then send back to you client. 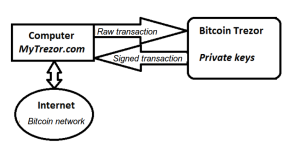 The client then broadcasts your signed transaction to the Bitcoin network. The Trezor protocol doesn’t allow extraction of the private keys from the device, so you can always spend your coins safely. By this time, you probably ask yourself what happens in case you loose your Trezor or in case it is broken. 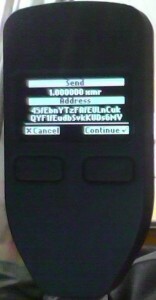 The answer is easy: during the initialisation of your Trezor, a 24 word seed is shown on the screen of the device. You need to write these words down. This is the backup in case something goes wrong. It’s a BIP32 seed, so you can import your backup in a lot of different wallets (blockchain.info, mycelium, electrum, …) or in a new Trezor device. Your Trezor is also protected by a PIN code, so in case someone steals your device, he can’t get his hands on your coins. Optionally, you can even set multiple passwords on your Trezor device. Every password crates a new account on your Trezor and provides plausible deniability: you can never see how much accounts are stored on the Trezor. Back to Monero. What NoodleDoodle did was writing a piece of software that makes Trezor compatible with Monero. 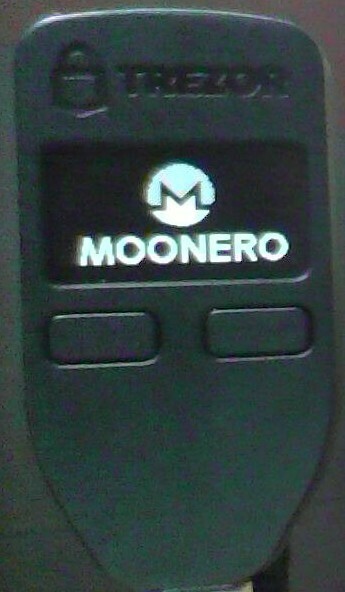 This makes it possible to securely store your moneroj on the Trezor hardware wallet. I tested this software, and the it functions in a similar way as the Bitcoin version of the software. You can’t send transactions unless your Trezor is plugged into your computer. 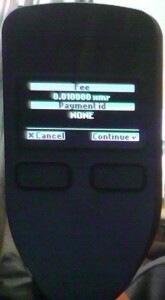 Transactions are broadcasted after you confirmed it by pressing a button. You still need to perform all actions from the command line wallet. For usability, I hope the Trezor will be integrated in the “official” Monero GUI. One minor catch: your private viewkey is sent to your Monero client. By default this information is deleted when you close your client (note that with the Bitcoin version of the software, your “master public key” is also shared with your client). I asked NoodleDoodle and it will optionally be possible to have a watch-only type of wallet in the future, so you can watch incoming transactions while your Trezor isn’t connected to your PC. When you want to give this Monero firmware version a try, you can download it here. The download also includes a small manual on how to update your Trezor and on how to use it. It is possible NoodleDoodle will still change some features and user experience, so when the software considered “stable”, I’ll write a small manual with some printscreens to help you get started using Monero securely. If you don’t yet own a Trezor, you can buy one here. Note that this is my personal affiliate link. If you buy a Trezor through that link, I get a % of the revenue (but you just pay the regular price!). Does this allow you to store your XMR and BTC in parallel? I heard that the Dash firmware for Trezor allows you to do with with your BTC. Yes! You will be able to store your XMR alongside your BTC on the same device.